Paying off debt is one of the biggest financial hurdles facing people every single day. While the concept of paying off debt seems simple enough, it can seem like a monumental effort to make it happen. It is one thing to say, “I want to pay off debt.” And a completely different one to payoff debt. 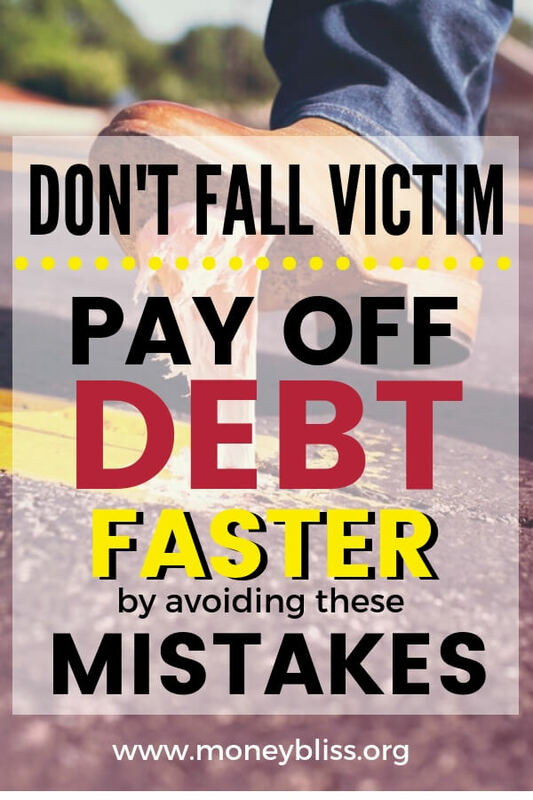 Normally, the reason why people fail is because they are a victim of one of the common debt payoff mistakes. For us, when we paid off $53,000 in debt over 12 months, it didn’t just happen. The commitment to pay off debt is real. 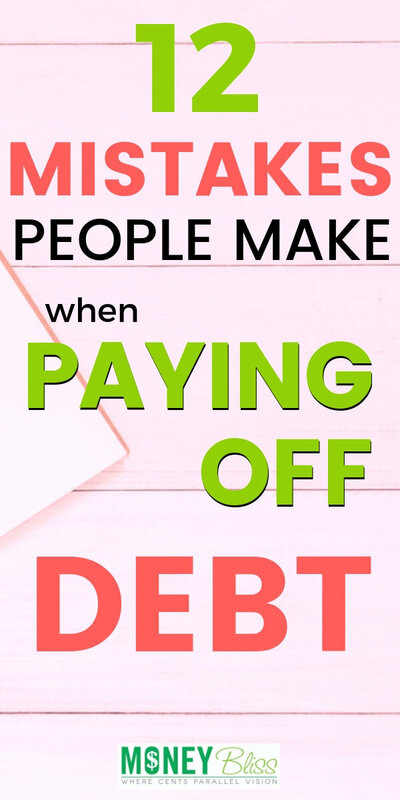 As a money coach and speaker, I realize the pain points people have when paying off debt as well as the common debt payoff mistakes. It is true. I hear the same things over and over. The setbacks they had while paying off thousands of dollars of debt and how they had to overcome them to move on from debt. Learn from our debt mistakes, so you are able to payoff debt quickly. Paying off debt is not the first step on the Money Bliss Steps to Financial Freedom. When trying to organize and get ahead with your finances, you must start on a solid foundation. That solid foundation begins with an emergency fund. In order to get ahead, we must be prepared for the unexpected. It isn't what; it is when. Tip: Start an emergency fund first. 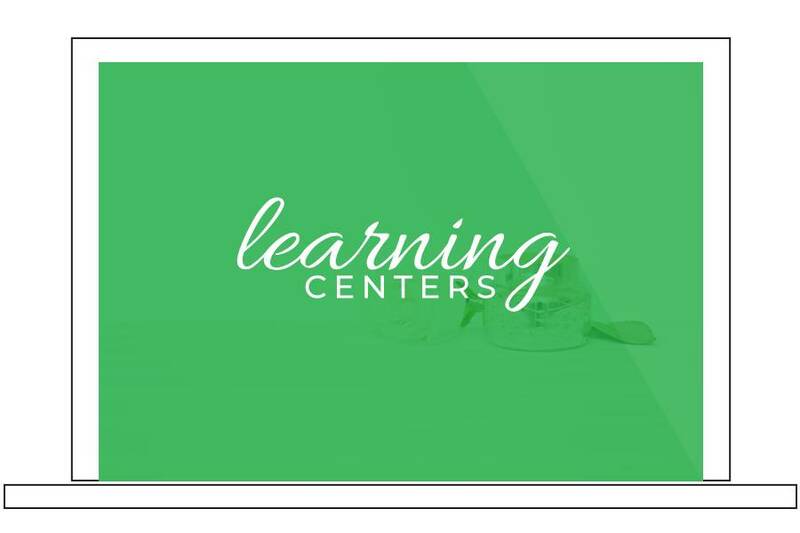 Learn everything you need to know on how much to save, where to put the money, etc here. That begins the building of a solid foundation with money. The worst financial advice most people get is to attack everything at once. Save for college. Pay off debt. Pay off the mortgage. Start an emergency fund. Aack! That advice is awful. Downright awful. You are walking on thin ice. At any moment, a crack will appear. The question remaining is when will the ice break and things come crashing down. It is impossible to attack everything at once. Making any type of progress is unfeasible. Tip: Take things on step at a time. Think of climbing a mountain. You can’t just jump to the top (and if you can, I want to see it). Start small and work your way to the top. That is the reason behind the Money Bliss Steps to Financial Freedom. Another common misconception is paying off debt once you are making real good money. 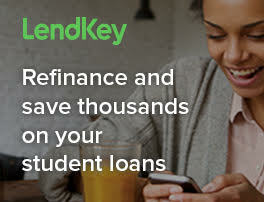 I thought I could pay off my student loans once I made just a little bit more than I currently made. Guess what? I wanted just a little bit more each and every time. Making more money isn’t going to change the current debt situation. A pay raise doesn’t mean an inflation on lifestyle. At least not while debt is part of the equation. Tip: Regardless of your current income, start attacking your debt bit by bit. 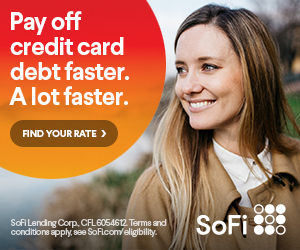 An extra $100 each month will take years off the debt payoff date. Learn your debt payoff date here. 4. What Caused Your Debt in the First Place? Understanding this will utterly change your money situation for the positive. What happened for you to accumulate debt? Was there a single trigger? Or did it snowball so fast that you couldn’t stop it? The list can on and on forever. Our emotions drive our money purchases. Tip: Sit down and figure out what caused your debt in the first place? The common debt payoff mistake must be handled or the debt cycle won’t stop. Paying off debt doesn’t just happen. If it did, reading this would be pointless. Something must change. Sacrifices must be made. If and only if, the end goal is to be debt free. When paying off debt, paying for past purchases must happen at the same times as paying for the new purchases. Habits must change to chunk away at the total debt total and lower the debt payoff date. Remember from the previous debt payoff mistake, those habits must be changed. The spending freeze doesn’t go on forever. It happens only while paying off debt. Tip: Ask yourself, are you willing to make changes to pay off debt? If the answer is no, then wait to pay off debt. There is no reason to attempt to pay off debt only to fail again. If the answer is yes, then learn the first step of five to pay off debt – create a war against debt. What is your reason for paying off debt? For us, it was to travel more often and spend quality time as a family. The debt cycle tends to happen again and again for those without an end goal. This is an important area to sit down and discuss. What is your vision in life? Tip: Paying off debt takes dedication, perseverance, and grit. There are sacrifices along the way to pay off debt quickly. By having an end goal in mind, then you keep your motivation spinning along your path. To successfully get out of debt, you need a plan. But, if numbers aren’t your thang and the reality of the debt situation sinks in, it is possible to turn and run in the complete opposite direction. Thus, never starting on a plan and another common debt payoff mistake. Throwing money at various debts is good. However, with a plan, success happens faster. Knowing a pay off debt is huge with a plan (AKA motivation). Stop wandering on paying off debt. Tip: Download our debt forms to know the details behind each debt and the totals. Then, go here and create your plan to get out of debt. 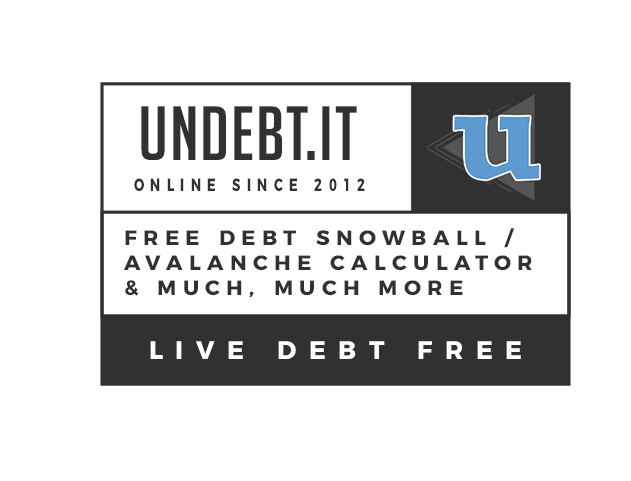 Learn more about the debt snowball vs. debt avalanche. 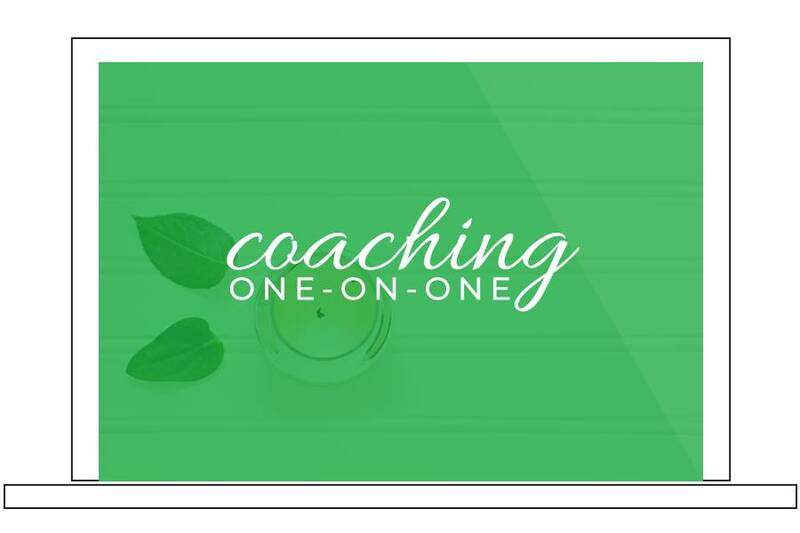 Need more help with a plan, schedule a Kick the Cash Flow Killer (Debt) Consult. Motivation is huge when paying off debt!! This common debt payoff mistake will make or break your success. Go here and pick up our debt guide. This provides the motivation to succeed. Tip: One of the best ways to keep motivation high is to plan milestone celebrations. They don’t have to be huge or costly. For example, one debt gone, then make an ice cream sundae bar to celebrate. When debt is completely paid off, then take the family on a vacation (of course, saving money and paying in cash is a must). Track your progress visually with our debt tracker. This common debt payoff mistake is why so many try to pay off debt and fail over and over. The continuous debt cycle is harsh. The debt cycle must be stopped to start paying off debt. If not, then you pay off debt only to accumulate more debt in the process. This is a perfect example of Pay Peter to pay Paul. Debt is moving from one pocket to another. Thus, continuing the debt cycle. Tip: Stop using debt as a method of payment. Period. Debt cannot be an option anymore. If you can’t afford to pay for the item in cash, then you do not need the item. Terminate this wicked debt cycle once and for all. Learn the surprising advantages of budgeting your money. Ugh. When I first started out on this thing called budgeting, it seemed like there was always an unexpected expense. I just couldn’t seem to get ahead. And then, I realized it wasn’t really unexpected. It is forgotten expense. Oops. Common examples of unexpected expenses include new car tires, new prescription glasses, various school related expenses, the list can go on and on. Unexpected or forgotten expenses? Don’t fall into the trap with this common debt payoff mistake. 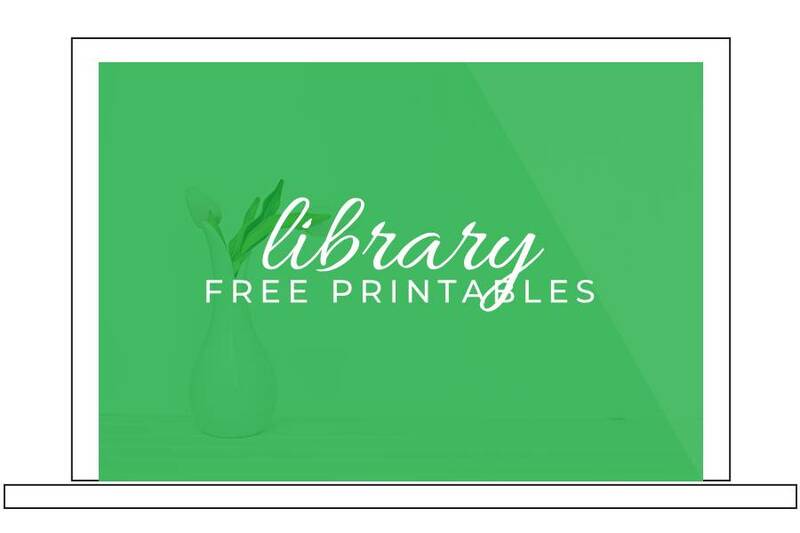 Tip: Download our Cents Plan (AKA budget). There are over 76 budget categories to make sure there are no unexpected expenses. Then, start sinking funds for those expenses. If something crosses your path that is unexpected while paying off debt, that is why your emergency fund is vital. Understand why sinking funds are so important. What causes the spending of money? 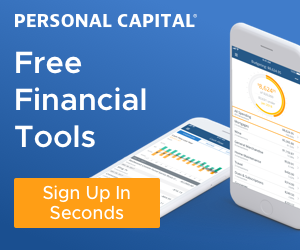 Not knowing the spending pitfalls is a common debt payoff mistake, but also, a huge distractor in saving money to reach financial freedom. These habits have become so ingrained that we don’t even realize it. Maybe it is a society push to spend money in these areas. Maybe it is a downfall of a Target run or Amazon online shopping? Coffee run? By knowing your spending pitfalls, you can start consciously making changes. Then, pay off debt faster and then save more money. Tip: Make a list of your impulse purchases in the last month? How much does it add up to? Of those purchases, were they needed? Do you regret any of them? What store is your Achilles’ Heel? Most people don’t use a budget. However, studies have shown that millionaires use a budget. Don’t fall into another common debt payoff mistakes without creating a budget. To succeed with money, you must know where your money is going. This is true across all income levels. Create a budget that works for you. This aligns with making a plan for your money. Tip: Most people make a budget and give up within the first month and then again in month three. Stick to your budget while paying off debt. From the list of best methods of budgeting that you need to know, find which budgeting method works best for you. This is still debt. No matter how you shake it. 0% interest will come due at some date. This debt won’t magically disappear because it has zero percent financing. If you couldn’t afford to pay in cash or pay your balance off in full before, then how in the world will you pay it off now? The argument on zero percent financing… “I can make more in the market.” Why, yes you could in a bull market. But, what happens if something changes and your gain tank? Then, what? Also, that debt is still looming over your head until it is PAID. IN. FULL. If credit card got you in trouble the first time, will things truly change this time? There are some points I will agree with Dave Ramsey and this is one of them. There is no better way to stop the cycle of overspending than to destroy the credit cards that got you in debt. The common fear is… “What about my credit score?” Yes, your credit score will adjust to the abrupt not using of the cards and closure of them. However, in the long run, you are better off to get the debt off your shoulder. It is possible to rebuild the credit score once the credit cards are paid off. Plus if you have a mortgage or auto loan that is being paid on time, the credit bureaus are seeing proper usage of credit anyway. 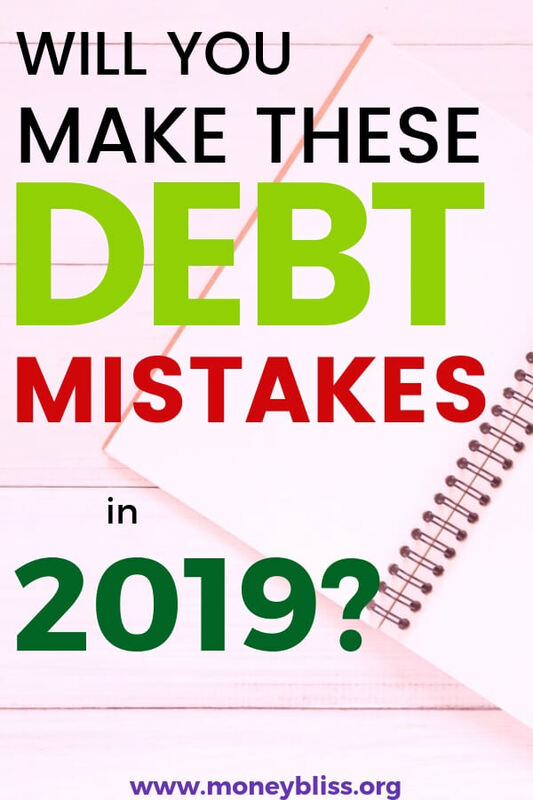 Anyone of these common debt mistakes can hold you back from becoming debt free. Honestly, more often than not, giving up on the debt is more likely. 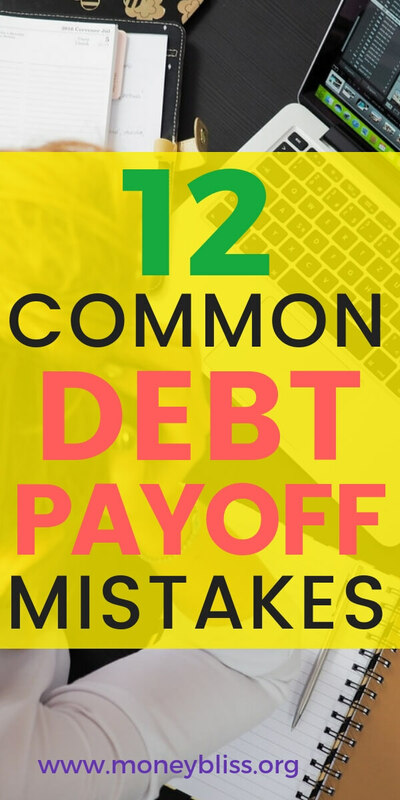 Now that you know these common debt payoff mistakes, avoid them when paying off debt. 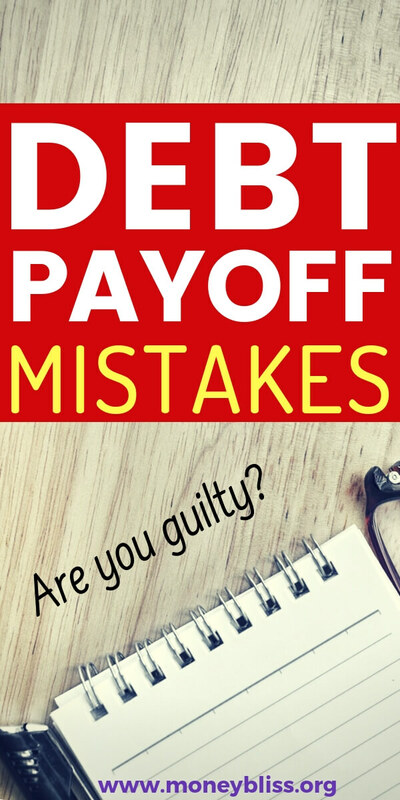 Are you ready to stop making mistakes while paying off debt? Unsure where to start? How to figure it out? Click here for more help. Make sure to check out how to make a budget in 7 simple steps.